Traveling anywhere in peak or rush hours with associated headache and heartache is universal. It has nothing to do with any particular country or ant part of the world. Whether in Lagos, New York,mJohannesburg, London, Paris or Tokyo, the rule of the thumb is whenever one has an appointment in peak hours, leave the house or whatever is your place of departure, hours ahead of time. This is because there are too many vehicles, including your's, clogging the road. Weekends, when less traffic will be be anticipated, is getting worse too. "I called the person whom I had a business meeting. I said I was on the block, though I was still about four blocks away. She expressed appreciation that I called to let her know despite fallen behind in schedule, and she said so many others don't care to call about how close or far away they are in keeping an appointment." "Hell no!" Hector Colon, a resident of East New York in Brooklyn but working in Manhattan exclaimed, when asked if loves the peak or the rush hours. The reason he says he doesn't like going out in peak hours is the traffic. Along other family commitment, he prefers to work in the night; leave his home when the traffic is low and heads back home in the morning, in the direction of low traffic. The need to avoid headache from insane traffic is a major factor for many people who prefer the night night or afternoon duty, where family or employer's preference or available slot are not determinants. Yet, there is a deluge of people who prefer the early morning journey to work and returning home in early evening with the traffic at its maddest situation. Many people say it isn't that they enjoy it, but that if is what duty has imposed on them. Just as heavy traffic affects commuting in New York City and other major cities around the world, people traveling from smaller and seemingly livable cites in New Jersey are not immune from peak hour drive into New York. Many of the buses arrive late behind schedule after snarling through the clog in the tunnel. Some commuters from New Jersey are already used to it. They say it is the traffic in the tunnel that delays the buses and a bus that is supposed to arrive at 0730 am doesn't until about thirty minutes later. "Is this bus not supposed to be here at 0730?" a passenger waiting for a bus asks another passenger on the queue. "It is the traffic at the tunnel," another passenger explains with disgust manifest on his face. On the floor near the queue, a man is asleep on the floor using his box as a pillow. He is not homeless, but also waiting for the bus. It us part mastery of the system that when a bus doesn't show up in time, people who are exhausted from having worked 16 or more hours will have no choice than seek comfort waiting for the bus rather continuing standing and thereby elongate hours at work. 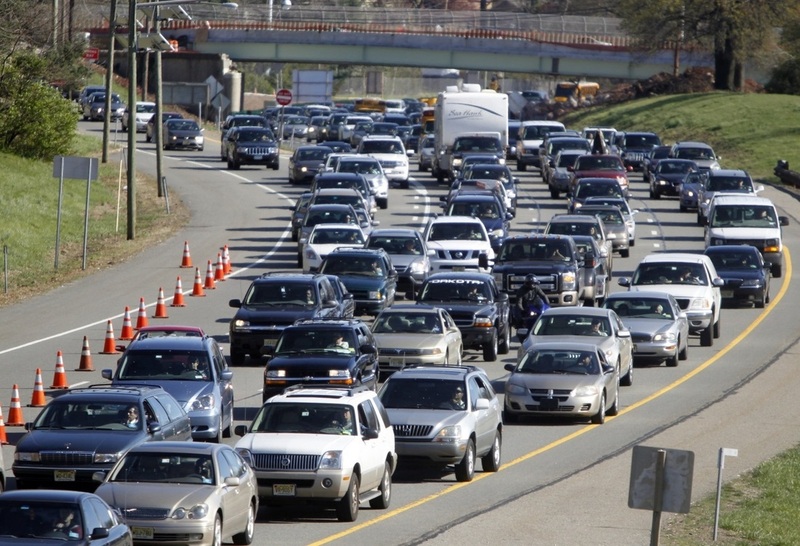 Some people in response to interview questions said the weekend travel is worse at the tunnel between New Jersey and New York, because many people who may have been traveling on buses bring out their cars on weekends. Therefore,they that say early morning hours, early evenings on weekdays and weekends are the most clogged hours at the tunnel. Peak or rush hour is the period when most businesses and offices are open to the public, and the period things are easily get done. This explains the reason majority of people are on the road during the period, leafing to high level of vehicular and human traffic in major cities like New York City have where major intersections have become spots of competition between motorists and pedestrians on who have the right of way. All these put together, will remind people with sense of history and music of yesterday, about Fela Anikulapo Kuti's song, "Ojuelegba" - a reference to a neighborhood in Lagos, Nigeria, and the traffic confusion there in the '70s, and that nothing has changed. If anything, the traffic confusing continues to multiply around the world - part of where it may have started before its emergence in a Lagos.